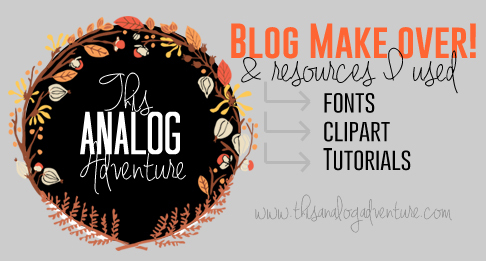 This Analog Adventure: Blog Makeover! How to create a blog header with navigation by thewonderforest. Great step-by-step tutorial that includes slicing up and then re-assembling your header to make link clickable. Highly recommend! Removing border around images in blogger. I used the second method they discuss, and it worked like a charm! Took me some digging to find this. How to make your facebook page pretty - this one helped me install some facebooks page apps & change the photo for them so that they matched my blog aesthetic. Adding a custom hover pin-it button by a typical english home. pretty self-explanatory! 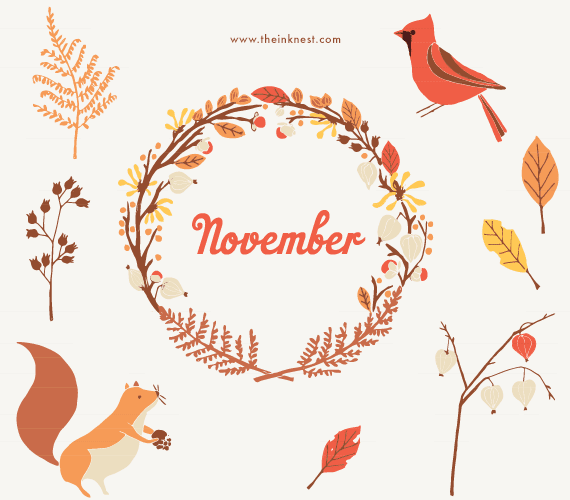 Clipart - 'November', purchased from The Ink Nest. There are so many wonderful clip art sets here! This was the initial inspiration for me to redesign my blog, and I couldn't be happier with this purchase. Social Media Icons - Aileen Barker Design, I purchased these as a set off her etsy shop. Let me know what you think of the new design! Is there anything I need to change? I love this. That is amazing that you've created your own site. I have been working on mine as well but I am still not quite satisfied yet. I will definitely check out those clip art shops. Thanks for the share! So last night I revamped my own header using that navibar tutorial. It totally worked. I created all my images in illustrator then transferred it to photoshop. So exciting. I am definitely going to play around with it. I love the new blog design! I am stopping by from Wildcard Wednesday. I will definitely check out those shops:! So posh!!! I´m loving this new layout!!! That one is pretty great! I didn't even know you could do that with facebook. The things you can learn! haha. Looks awesome! Here's a little site that I used to recently change my "pin it" button. 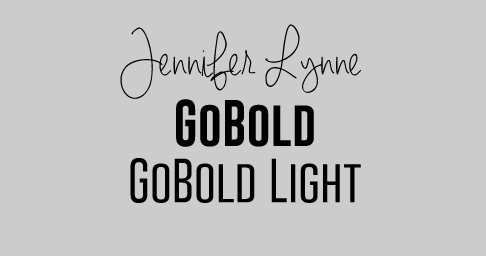 I wanted my own custom button to flow with my blog design layout. So, I created my own in "pin this image" in photoshop and love the subtle change. It's the little things that I think make a HUGE difference. Your blog looks awesome dear. I need to do this upgrading thing on my blog too. Thanks for sharing the info dear. This looks great, Jessica - very refined. Perfect for autumn!